Usually, I love winter but I was so, so glad to spot these snowdrops today. I keep looking for the errant crocus, but no luck yet. I love them. It was actually 67 F here yesterday, but then today I walked outside and realized it was dumping snow on us again. I love the winter, but I think I’m about ready for a snowdrop or two. Pretty!! Spring is just around the corner! We’ve had our out for a week or so now, if only the rain will ease up, I might just get out into the garden (which resembles the battle of the Somme) and take some photos! So cheering. 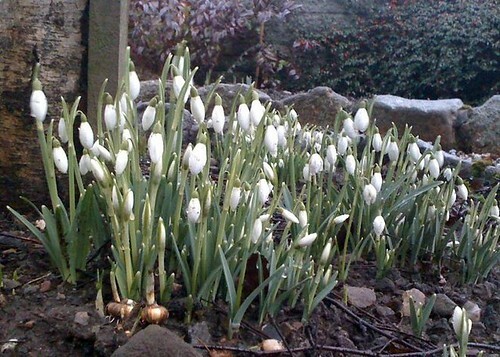 We have lots of snowdrops and signs of other bulbs popping up. In a couple of weeks it will be wonderful – we are in a new house so each bulb is a surprise for us! That’s one of the things I love about the Highlands – spring is very tenacious, like Mother Nature is saying, “Ready or not – here I come!” You’ll be reveling in those long summer days before you know it! Gorgeous! I completely understand why!